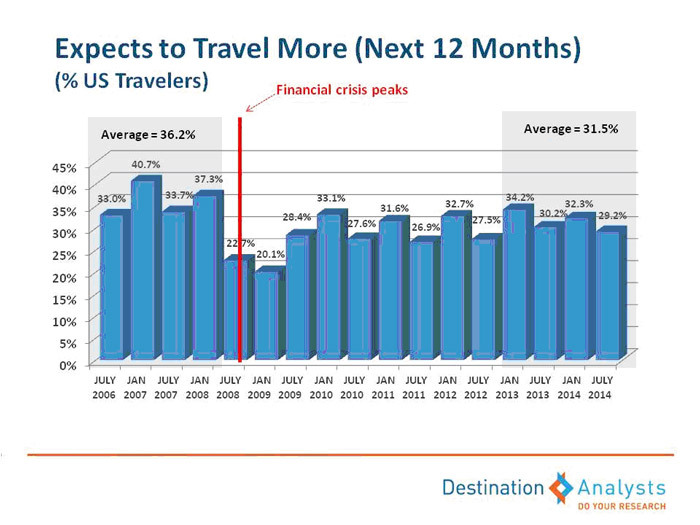 Americans are showing strong levels of optimism for leisure travel in the upcoming year. Yet, we have not fully recovered from the effects of the 2008 financial crisis and recession. Levels of expected (as well as actual) leisure travel are reserved compared to the period immediately before the crisis. On a positive note, however, it is clear that we’ve moved out of our strong post-recession desire for discounts and special offers, with traveler interest in these sharply diminishing in recent years. In his recent keynote address to the Pennsylvania Association on Travel and Tourism (PATT) in Lancaster, Destination Analysts Founder and Managing Director David Bratton briefed the industry on the current state of leisure traveler sentiment. In his speech, Bratton presented results from Destination Analysts’ bi-annual The State of The American Traveler Survey. This comprehensive survey is the nation’s first and longest running tracking study of American leisure travel sentiment conducted exclusively for the destination marketing industry. Collected every six months from a representative sample of 2,000 domestic leisure travelers, the survey illustrates trends and opinions of our nation’s leisure traveling set. Bratton pointed out that while this was great news for the industry, to the surprise of many in the audience, “we have not yet fully recovered our mojo from those heady pre-recession days.” The chart below shows the detail. When we compared the average for the two years immediately prior to the financial crisis of 2008, we see a significant drop in the proportion of Americans who are expecting to travel more. In the two years immediately prior to the recession, 36.2 percent of leisure travelers said they would travel more. This compares to only 31.5 percent for the most recent two years. Bratton explained that a similar story can be seen in the percent of travelers expecting to cut back on their travels. 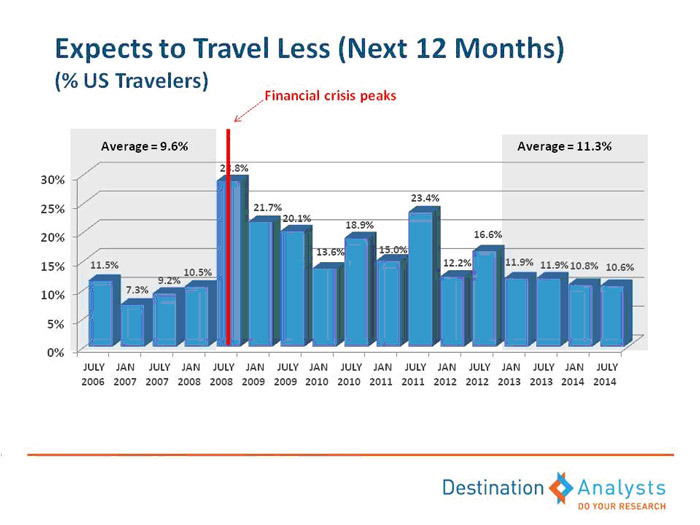 As the chart below shows, prior to the recessionary period fewer than one in ten (9.6%) of American leisure travelers said they would cut back on travel. In the most recent two years, this result is slightly higher at an average of 11.3 percent. Clearly we have a way to go. This story of strong (yet from an historical perspective diminished) travel expectations is supported by the actual number of leisure trips (50 miles or more one way) that Americans report having taken in the past year. 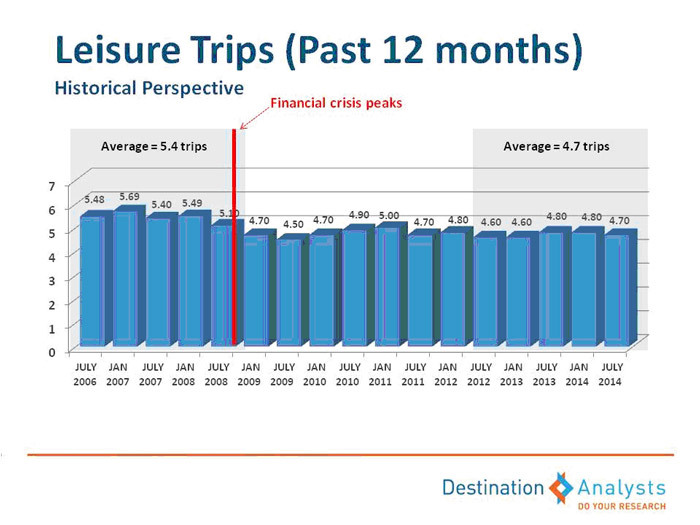 As the chart below illustrates, the annual number of leisure trips taken by the typical American is down, from 5.4 trips in the immediate pre-recession period to 4.7 trips in the most recent five survey periods. Bratton noted that “the real key to understanding current traveler confidence may be seen in looking at their spending expectations.” Nowhere is the picture clearer than when we compare the proportion of travelers who expect to increase their travel budget in the next year. 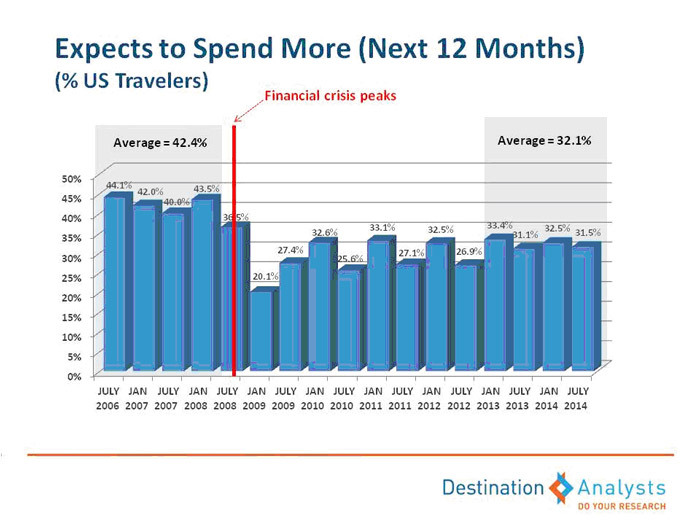 The chart below shows that in the two years prior to the recessionary crash, 42.4 percent of traveler said they expected to increase their leisure travel spending in the upcoming year. In the most recent two years, this average stands at only 32.1 percent, nearly a 25 percent decrease. While spending expectations are weak, Bratton pointed to numerous positive signals in leisure traveler confidence. These included greatly reduced proportions of travelers saying their personal financial situations, gasoline costs or airfare prices have kept them from traveling more than they would like to have traveled in the past year. 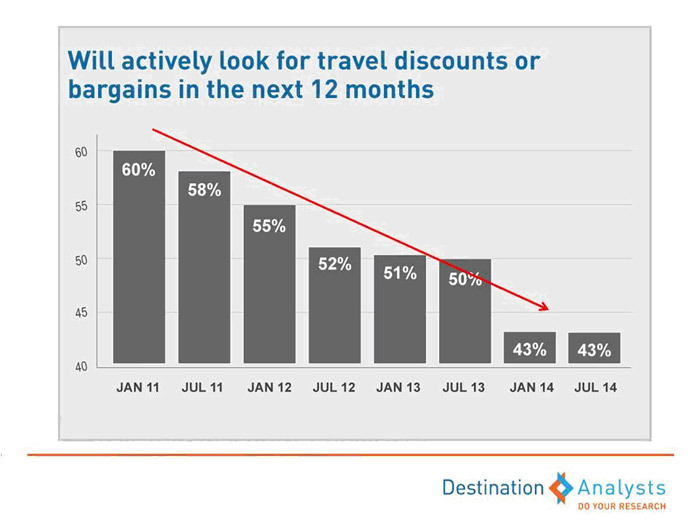 Most encouraging, however, may be the marked decrease in consumer interest in travel discounts and bargains. Immediately after the financial collapse nearly 70 percent of travelers said they would be “actively seeking” travel discounts and bargains in the upcoming year. As the chart below shows, there has been a sea-change in this attitude. In the past year, just over 40 percent of American leisure travelers will be discount and bargain hunting. Click here for the complete PowerPoint presentation.